Omega World Travel will join professionals and leading organizations in the federal and state government travel sector March 5-7, 2018, as an exhibitor for the second annual GovTravels symposium. Held at the Hilton Mark Center in Alexandria, Virginia, GovTravels is the only event of its kind where stakeholders in both government and the private sector can meet and collaborate on regulations, technology, challenges and best practices in government travel. This year, GovTravels adds the Defense Travel Management Office (DTMO), which oversees commercial travel for the Department of Defense, as an official co-sponsor. The 2018 symposium incorporates contributions and feedback from the General Services Administration, DTMO, the Transportation Security Administration (TSA) and private industry. In total, GovTravels offers access to presentations by significant speakers, discussions with travel decision makers, educational breakouts, and a full-fledged expo space. “Omega is proud to participate in this all-important symposium. GovTravels gives travel agents and suppliers the opportunity to learn more about the government’s travel needs and future service requirements. We are pleased to participate in ‘The Future of the Travel Magement Company (TMC) within Government Travel’ panel – to include Goran Gligorovic (Executive Vice President, Omega World Travel), Marc Stec (Vice President of Strategic Business Initiatives, CWTSato Travel), and Kevin McElroy (Advisor to the CEO, CI Travel), moderated by Greg Foscato, Regional Sales Director on Omega’s team. We hope the audience benefits from the almost 100 years of travel industry expertise represented therein,” stated Gloria Bohan, Omega’s President and CEO. 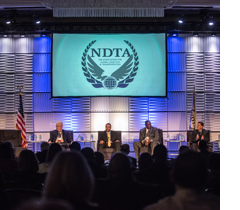 Presentations and panels with leading voices in travel, including John Bergin, Business Technology Officer for the Department of Defense Chief Information Officer (DOD CIO), LTG Russel L. Honoré, USA (Ret. ), former Commander Joint Task Force Katrina; Mike Premo, President and Chief Executive Officer, ARC; Sean Schwinn, Vice President of International Strategy and Market Development, Boeing; William Mansell, Director of the Defense Travel Management Office, and Sean Schwinn, Vice President of International Strategy and Market Development, Boeing, Mike Premo, President and Chief Executive Officer, ARC. Educational breakouts taught by DTMO, GSA, and select industry partners on topics including DOD Commercial Travel programs, the City Pairs Program, Federal Travel Regulation, and Strategic Sourcing Initiatives. “Folks who attend GovTravels 2018 will “get the edge” on the Future of Government Travel and the Traveler Experience. We are excited for both our Government and Industry travel professionals to experience this event.” said Vice Admiral (Ret.) Andy Brown, NDTA’s President and CEO.